Locke and I had the idea (it might have been entirely HIS, but let’s say OURS) for a random comic where Locke suddenly transmutes his coffee. We’ve always wanted to do a Fullmetal Alchemist joke, and I’m always wanting to put in more Star Trek references, so this comic came from that. I don’t watch much anime anymore, but Fullmetal Alchemist has got to be my favorite. 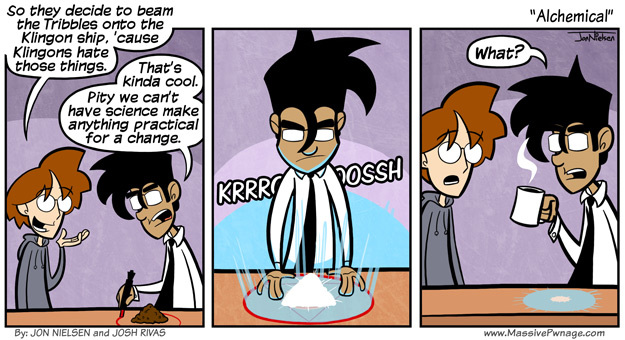 This entry was posted on Monday, September 14th, 2009 at 12:00 am and is filed under Comics. You can follow any responses to this entry through the RSS 2.0 feed. Both comments and pings are currently closed. You’re assuming Alf, that Locke didn’t have another circle drawn offscreen with water and a mug. Seeing as how two circles can be drawn to make chimera, and fuse items…well, lets just say we thought of that, and decided Ence would ultimately notice if Locke has a bunch of stuff on a table. It’s one of those animes/shows that you have to watch the whole thing from start to finish. its not that long if i remember right though, 26 episodes i think. xD Nice. FMA is awsome and this was hilarious.